Nanometric cutting is an ultra-precision manufacturing method which is employed to fabricate components requiring submicron geometry accuracy and atomically smooth surface finish, such as those utilized in the optical, semiconductor and opto-electronics industries. 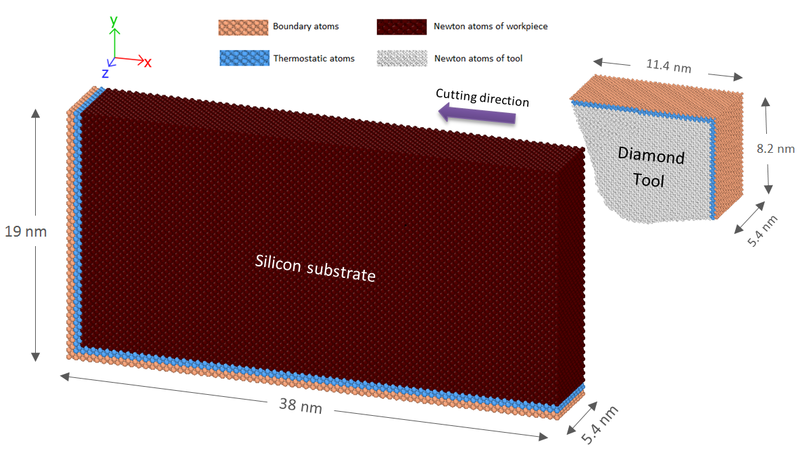 During high-precision nanometric cutting, the fractal surfaces involve interaction of few atomic layers resulting in small volume and rate of material removal. An on-line examination of a nanometric machining process aside from being troublesome is surrounded by current experimental limitations as well. Consequently, scientific phenomena occurring at the contact interfaces between the two moving asperities at nanoscale is difficult to be understood by experiments alone. Accordingly, molecular dynamics (MD) has become a preferred choice of investigating minute details of many non-trivial machining processes. The present study aims at using MD simulation to investigate nanometric cutting of hard-brittle materials such as silicon in order to obtain a perfect and unambiguous knowledge about the macroscopic and microscopic aspects of this process. The MD simulations in this work were performed by using a public-domain computer code, “large-scale atomic/molecular massively parallel simulator” (LAMMPS). A schematic representation of the MD model has been shown on Figure. For more information about the project contact Xichun Luo (xichun.luo [at] strath [dot] ac [dot] uk), Professor at Design, Manufacture and Engineering Management at the University of Strathclyde.